I recently stumbled across a painting by Hans Zatska called 'Night fairies' which I found beautiful and ethereal(I recomend that you give it a google). The painting depicts fairies floating in the sky in beautiful blue and green outfits whilst a cherub sprinkles golden stars over them. With this image as inspiration I chose an unusual colour of swarovski beads called Indicolite which have a blue green look to them.These graduated beads have been interspersed with gold colour coated bicone beads . 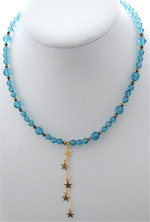 These beads make up a 17" necklace with a gold filled (hard wearing) hook clasp. The focal point to this piece is a 3" drop of gold filled chain embellished with 8mm gold coloured metal star charms.Like the smaller bicone beads, these charms really catch the light and seem to twinkle.This piece is perfect to accompany an evening outfit and is on trend with the use of bold colours and stars.